I headed west along the Manly Scenic Walk into the suburb of Fairlight, where I stopped and first used a resource that would become invaluable throughout the rest of my walk. A few nights before when preparing online for my walk, I discovered the incredibly useful website Walking Coastal Sydney and its equally helpful iPhone app Sydney Walker. I consulted Sydney Walker, turned south and went that-away down the North Harbour Walk. Originally, I had planned to take the long scenic route around to the Grotto Point Reserve and from there head to the Spit Bridge. 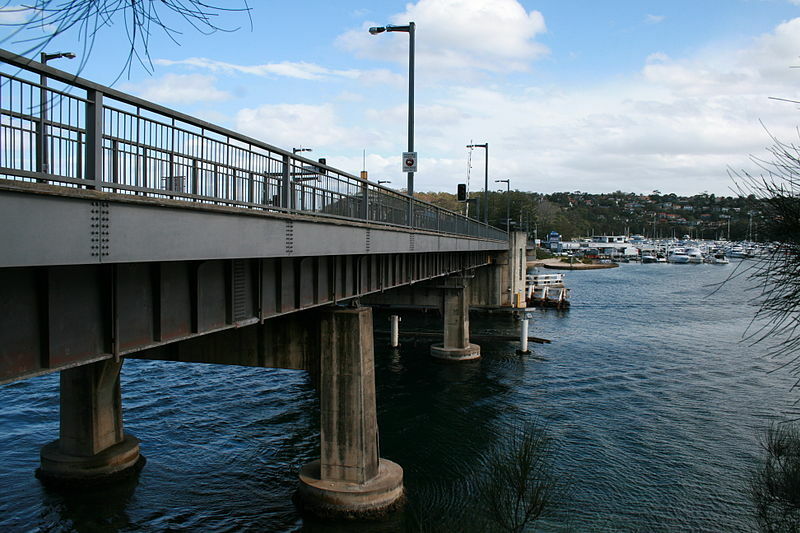 When I saw (or thought I saw), however, that the low-tide pathway was under water I switched to the much shorter inland route through the suburb of Balgowlah. It was in Balgowlah that I encountered the first serious uphill part of my walk – and in particular, a high and narrow flight of steps. I mostly prefer to lightly jog up steps or stairs, and although I briefly thought about taking these ones slowly I decided to jog up these ones (albeit slower than usual). I made it, although when I got to the top my right leg wobbled and almost went out from under me. …but a moment later I saw at path’s end that there was a taller flight of steps going uphill. I groaned and decided this would be a good time and place for my first break. I would rest, drink some water, maybe eat some of my muesli bars and in 15 minutes’ time get up those damn second steps. It was shortly before 10:30am. During this first break, something happened that I may or may not devote a separate post to. This incident had its funny side, but it could have also become very serious and not funny at all. When it was all over I was glad to get out of there, and it perhaps gave me extra wings in getting up those second steps. During the second leg of my walk, I went overhill through Balgowlah and downhill into Seaforth to find myself overlooking the Spit Bridge. …until I spent a few nerve-wracking and vertigo-inducing minutes going down perhaps the steepest flights I have yet encountered in my life. Bloody steps – uphill or downhill. Fortunately, the walk across the Spit Bridge was a good way to unwind, and the d’Albora Marina looked a good place to stop for my second rest. Shortly after 11am at the marina I bought a can of Diet Coke, sat down at an outside seat and relaxed for another 15 minutes. So far, despite the first-break incident and the multiple steps of terror, my walk was going very well. I was constantly drenched in sweat and my body was starting to feel the strain, but I was enjoying myself. It was a glorious day; I was being active; I was seeing parts of Sydney that I had never seen before; and there were many interesting sights to enjoy. My walk was turning out to be everything I hoped it would be, and more. I finished my Diet Coke, got up, put my hat and backpack back on, and once again set off. For the third and also most likely the fourth leg of my walk, I had planned to head along the eastern water’s edge of the suburb of Mosman to Bradleys Head, next door to Taronga Zoo. …and even after the road finally ended about 30 minutes later, I still found myself going uphill towards Spit Junction. Up ahead a 7-11 and the enticing fantasy of a Slurpee beckoned, but as I drew closer I saw that not that much further beyond was downtown (or should I say uptown) Spit Junction itself, where perhaps a nice air-conditioned pub could be found. I pressed on for another 5-10 minutes until I came to Military Road in the heart of Spit Junction, and a wonderful sight across the road – the world going downhill again. As well across the road, a very pleasant-looking tree-shaded square looked very inviting. It was indeed time for another break. I crossed over to the square, sat down in some shade, finally had a couple of muesli bars and guzzled the last of my water. I had thought about conserving some of my water until the next break, but I was thirsty and there would no doubt be a shop or service station ahead so I gladly drank it all. I relaxed again, enjoyed the moment and was grateful again that I’d set out on this walk. I was also confident that I could still make it all the way to the Sydney CBD. At 12:12pm, I got back up and set off again.